Occupation means possessing/exercising actual authority over another country’s sovereign territory. A nation who has the sovereign rights to land cannot be an “occupier” of that land. Israel has the lawful sovereign right – as well as the strongest historical, religious, and legal connection — to Israel, including Judea/Samaria and all of Jerusalem. The Jews are indigenous people of Israel, including Judea/Samaria and Jerusalem. The word “Jew” comes from “Judea” – because this is where the Jewish people lived. (Jordan renamed Judea/Samaria “the West Bank” during Jordan’s 19-year (1948-67) illegal occupation of the area, as explained below). Jewish kings and kingdoms reigned in Jerusalem and Judea/Samaria for hundreds of years (c.920 BCE – 597 BCE). For over 3,000 years, there was always a Jewish presence in Israel, even after conquests and dispersions of the Jewish people. Moreover, Jerusalem was never the capital of any country except Israel. Jews were also the largest religious group in Jerusalem since at least the first census in the 1840s. Jerusalem is mentioned almost 700 times in Judaism’s holy books. Jerusalem is never mentioned in the Koran. For millennia, Jews pray for Jerusalem and pray facing Jerusalem. Muslims pray facing Mecca, and have no prayers for Jerusalem. No Arab leader except Jordan’s King Hussein ever visited Jerusalem. By contrast, there has never been a Palestinian Arab state or kingdom in Israel, Jerusalem or Judea/Samaria. Ever. “Palestine” is not an Arab name but is a Roman name, named by the Romans in 135 CE for the geographic area, to attempt to de-Judaize Israel and Judea/Samaria, after destroying the Second Temple in 70 CE and crushing the Jewish Bar Kochba Revolt (133-135 CE). Israel thus does not “occupy” land belonging to any Palestinian-Arab foreign sovereign – for no Palestinian-Arab foreign sovereign ever existed. Most Arab “Palestinians” are not indigenous to Israel. Most “Palestinian”-Arabs immigrated into Israel from Arab nations and northern Africa (Algeria, etc.) after waves of Jewish communities started rebuilding Israel in the mid-to-late 1800s through mid-1900s. “Palestinian” Arab last names such as “al Masri” (meaning “from Egypt”) and “Mugrabi” (“North African”) reveal some of the Palestinian Arabs’ origins. Britain’s Balfour Declaration(1917) and legally binding international treaties, including Article 22 of the League of Nations Covenant; the Mandate for Palestine (1922), San Remo Resolution (1920), Feisal-Weitzman Treaty (1919) (an Arab-Jewish treaty, signed by the Emir of the Kingdom of Hejaz, now part of Saudi Arabia), the 1924 Anglo-American Convention [Treaty] (ratified by the U.S. Senate in 1925, making it a binding U.S. treaty obligation), designated the area that is now Israel including Jerusalem and Judea/Samaria and present-day Jordan as a “sacred trust” for reconstituting the Jewish homeland. Also, under the firmly established international legal doctrine “uti posseditis juris,” new states inherit the full borders of the preceding mandate. Thus, Israel is entitled to the full mandatory territory and borders, which include Jerusalem and Judea/Samaria – and originally even included present-day Jordan. (Arab nations in the Middle East – Syria, Lebanon, Iraq – received the full mandatory borders of the mandates that preceded those states, under the same doctrine.) Interested readers may wish to watch International legal scholar Northwestern Univ. Professor Eugene Kontorovich’s excellent video discussing this in detail. In 1922, Britain, in essence, lopped off 78 percent of the area legally designated for a Jewish homeland, to create Transjordan, later Jordan. The Jews were left with only 22 percent of the Mandate of Palestine designated for the Jewish homeland. In 1948, the Arabs rejected a UN non-binding recommendation to partition the remaining 22 percent portion of Palestine into Jewish and Arab states (the so-called “partition resolution”). Instead, six Arab nations invaded the newly reestablished State of Israel, in an attempt to obliterate Israel and murder the Jews. During the aggressive Arab war, Jordan captured and illegally occupied the eastern portion of Jerusalem (the “Old City” including the Jewish quarter) and Judea/Samaria for the next 19 years. Only two countries recognized Jordan’s illegal occupation. Jordan expelled and murdered the Jewish residents, destroyed 58 centuries-old synagogues and vandalized the 3,000-year-old Mt. of Olives Jewish cemetery in eastern Jerusalem. Significantly, during Jordan’s 19-year illegal occupation of eastern Jerusalem and Judea/Samaria, Palestinian Arabs made no claim for a state there. The1964 PLO Charter proclaimed that the PLO “does not exercise any territorial sovereignty over the West Bank or Gaza.” It also never mentioned Jerusalem. In 1967, Jordan attacked Israel again – even though Israel implored Jordan not to attack, saying: “We are engaged in defensive fighting on the Egyptian sector, and we shall not engage ourselves in any action against Jordan, unless Jordan attacks us. Should Jordan attack Israel, we shall go against her with all our might.” In the ensuing defensive Six-Day War, Israel recaptured eastern Jerusalem and Judea/Samaria and Gaza, restoring Jewish sovereignty to Jerusalem and Jewish sovereign rights to Judea/Samaria. In 1988, Jordan publicly relinquished any claims to Judea/Samaria and eastern Jerusalem. The 1994 Israel-Jordan Peace Treaty recognized the Jordan River (not the “green line”) as the international boundary. In other words, Judea/Samaria is on the Israeli side of the border. This further reconfirms that Israel is clearly not occupying land of a foreign sovereign. The Oslo Accords (1993-1995), signed by the PLO, acknowledge Israel’s territorial jurisdiction over “settlements.” Oslo never spoke of a Palestinian Arab state and in Prime Minister Rabin’s last speech, he spoke of establishing “less than a State” for the Palestinian Arabs and no giveaway of any part of Jerusalem. Israel has relinquished governing control in all of Gaza and 40 percent of Judea/Samaria. The Oslo Accords provided land within Judea/Samaria to establish a “Palestinian Authority.” And, in 2005, Israel unilaterally evacuated 10,000 Jews from Gaza and Northern Samaria. As a result, 98 percent of Palestinian-Arabs are living in these ceded territories, under Palestinian Arab rule. These territories are governed by Palestinian Arabs, with their own legislatures, courts, TV, radio, newspapers, police, hospitals, school system and municipal services. These Palestinian Arab governmental agencies are largely corrupt, brutal and hate-mongering. But they are their own, not Israel’s. In short, Israel no longer runs PA-controlled areas. Israel remains enmeshed with Palestinian Arabs only with respect to security issues, and that’s only because the Palestinian Arabs continue to wage war on Israeli civilians –– with exponentially increased rocket assaults and terror tunnels from Gaza since 2005, and continued terror assaults from Judea/Samaria. Israeli forces must foil dozens of such assaults each month. Thus, Israel is forced to maintain checkpoints in Judea/Samaria to prevent terrorist attacks from terrorist cells based in the Palestinian Authority. And since Israel’s unilateral evacuation of Gaza in 2005, Israel has had to make three significant military incursions into Gaza to try to stop Hamas’ incessant rocket fire on Israeli civilians, and to destroy Hamas’s terror tunnels. But that’snot“occupation”; that’s war to stop terror, and its attendant mess and tragedies. Notably, in 1937, 1947, 2000, 2001 and 2008, Palestinian Arabs rejected generous proposals to establish an Arab State in part of the remaining 22 percent of the area legally designated for the Jewish homeland. Instead, Palestinian Arabs maintained their genocidal goal of destroying and replacing all of Israel, and instituted the deadly intifadas, murdering and maiming thousands of innocent Jews. Further, Israeli “settlements” (Jewish communities and cities) are not an “occupation” since they are on sovereign Jewish land, legally designated for “close Jewish settlement” under the Mandate. Nor are settlements an “obstacle to peace.” Israeli “settlements” comprise only about 2 percent of Judea/Samaria. Since 1993, Israeli building has occurred only within existing “settlements” borders. There has not been a single new Jewish community built while the Arabs have built at ten times the Israeli rate in Judea//Samaria and much of it illegally. Moreover, even if Israel was an “occupying power,” settlements would still be perfectly legal – because only “forcible” transfers by an occupying power are prohibited. Here, Jews returned to Judea/Samaria voluntarily– and there has been no forcible transfer of Arabs out of these areas. But Israel is not an “occupying power” under the Fourth Geneva Convention (as Israel-haters falsely claim). The Fourth Geneva Convention is inapplicable because it is a specialized treaty among the “high contracting parties.” The treaty solely applies to wars between the countries who signed this treaty – and the Palestinian Authority and Israel are not signatories. Israel is also not an “occupying power” under the Convention because, as explained above, Israel has the sovereign right to Judea/Samaria; Judea/Samaria is not the territory of another sovereign country that signed the treaty, and Jordan withdrew its claims to Judea/Samaria. The False Claims of “Israeli Occupation” Are a Pretext for Terrorism and Ethnic Cleansing of Jews: So, then, why do the Palestinian Authority, Hamas and their supporters continue to perpetuate the Israeli “occupation” calumny? What is behind the Boycott, Divestment, and Sanctions (BDS) campaign aimed at delegitimizing Israel as an illegal “occupier” and “colonizer” of “Palestinian lands”? Why do they falsely label the areas that Israel has the sovereign right to as “occupied Palestinian territories”? Why do Palestinian Arab leaders continue to say anything – no matter how absurd and false – to deny Israel her legally guaranteed rights? Why did PA dictator Mahmoud Abbas, in his UN speech last week, falsely argue that the Balfour Declaration’s promise to the Jews of a national home in Palestine inflicted “a grave injustice on the Palestinian people” because Palestine was “inhabited by the Palestinian people” and was “among the most progressive and prosperous countries” back in 1917 – when in fact there were no“Palestinian Arab people” and there was never a country of Palestine, in 1917 or ever? It’s because proclaiming “illegal occupation” promotes the Palestinian Authority’s and Hamas’s goals of ethnically cleansing all Jews from the lands that the Palestinian Authority seeks to seize, and “justifies” terrorism. Indeed, Mahmoud Abbas asserted in his UN speech last week that Israel’s “occupation breeds incitement and violence.” Calling any residual Israeli presence, anywhere, within areas that the PA or Hamas deems to be “occupied Palestinian territories” serves as justification to engage in terror, promote international efforts to indict Israel, promote violence over peace, transform Palestinian-Arab terrorists into “freedom fighters,” and avoid negotiations with Israel for real peace. In fact, Israel does not occupy another foreign sovereign’s territory. Simply put, there is no Israeli “occupation” in Judea/Samaria/Jerusalem. 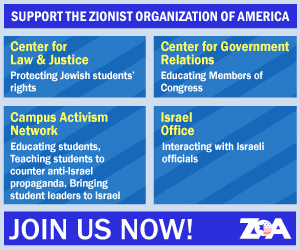 Morton A. Klein is National President of the Zionist Organization of America (ZOA). (Visit www.zoa.org; follow on twitter, @mortonaklein7) A major Jewish weekly named him one of the top five Jewish leaders in America.Another named him one of the top dozen “Jewish Activists of the Century.” He formerly worked in medical research with two-time Nobel laureate Linus Pauling(Chemistry and Peace).